Last year I wrote about doing a NYE swim at Dynamo. Dynamo did it again this year. They had three options: 7,500, 10,000 or 15,000 meters. Although i mentioned in my blog after last year thoughts of doing the full 15,000, I decided not to go for the 15k, but aim (again) for 10k. I told my coach, Laura, I wanted to prepare for this better than last year, and so have been swimming four times per week (mostly M/W/F/Sat) since September most weeks. I think the extra work paid off as this time, as the distance built, my arms got sore and fatigued, but not painful like last year. Victory!!! But I have gotten ahead of myself. So, on NYE I woke up at 2:45 am and headed to Dynamo. Everyone, regardless of distance, was starting at the same time. This made things simpler as people were doing the same thing in the lanes. And as people finished their desired distance, they got out. Maria marked when 7.5 and 10k were complete so there was no question. Last year it worked with everyone doing something different, but it was much simpler this year with everyone swimming the same intervals. My biggest concern: what happens when people get out to go to the bathroom? Yup – not “Will I make it?” or “How Will I feel” but…the bathroom. Given that last year I took 3 bathroom breaks, it was a real concern. But, I figured I would just know how many meters I missed, and make it up at the end. Easily solved! I just didn’t like that idea much but oh well. So, with that being on my brain, we gathered. The lanes were sorted out, but some people moved around early on with speed. I was down a few lanes from normal (a lot of who I consider “real swimmers (those who do stroke and are fast) really wanted to swim far apparently). And there were over 50 people there for the start. This is becoming a pretty popular event! And per Haley Chura’s facebook page, combined with regular masters swim, there were over 70 people in two pools on New Year’s Eve in the early am. That’s pretty impressive! Before we started, Maria mentioned that nutrition would be key in finishing this. People brought all kinds of fuel, PB&J, Bonk Breakers, etc. I am not much of a solids person when I train/race, so I kept with the fluids and Gu Chomps. Anyway, I made sure I brought nutrition – 3 bottles of fluid nutrition, 200 calories per bottle, one bottle per hour, and a bag of Gu Chomps taking me to about 250 calories per hour. Although I probably should have taken in more calories per hour, I had a plan, and was ready. I learned well from Marni – but I know I have more to learn. Working with her I have started taking nutrition to every swim, and I know it is important. I knew this wasn’t a race, but for fun, and to test myself. I do need to get better at fueling even in “for fun” events. After a bit of chaos, trying to get a group shot (there were too many of us to really get one), we got in our lanes and started swimming. Actual sets were given, and the first “warm up set” was 1,200 meters with occasional stroke thrown in to mix up some muscle use. As usual, I started an endurance event feeling goofy, and took a while to warm to it, meaning I had the confidence that I could finish strong (which happened at about 5,000 meters). Libby led most of the swim, with me behind her (except when we did stroke, then Laura went ahead of me) followed by Laura (my coach), Lora, Lynn, Tom and Jeremy (I think – I recognized him but funny – you don’t really learn people’s names swimming all the time). Anyway, Libby did a terrific job of pacing for the swim. I felt great behind her, and was able to be pretty steady behind her. Libby is someone I can just follow easily. The first time I rode with my coach her friends, Libby was the first person whose wheel I was just comfortable following, and spent most of the ride right behind her. Libby is just…steady and strong. The second set was a mix of pull and swim. And sometimes we added in fins on the swim sets for a change up. We also mixed in some stroke – back, breast, but none of us even considered fly (Pshew). At the end of intervals in each set I took in my liquid nutrition and occasional Gu Chomps. At the end of the second set (which was 4,000 meters long) we took a break. I ran off to the bathroom, and people took in food, coffee, etc. I came back, and we had a few more minutes until we started last set which Maria had just set up. She marked 7.5k and 10k so we knew where to stop. Around 5k I hit my stride, and time started flying by. I knew I could make it. I did state I may stop at 7.5k depending on how my arms felt remembering how much they hurt last year, and that it took 2-3 weeks for them to feel normal after. But, as we got close to the 7.5k mark, I was doing OK. Yes, my arms (well … those muscles around the arms and upper back) were sore, but I wasn’t fighting through actual pain like last year so…I kept going. I took it interval by interval. But, once I passed 7.5k I knew I had it in me, and my arms were good to go, and kept on going right behind Libby. Apparently I opened the flood gates, so to speak, and at about 8,500 meters I had to go to the bathroom again. So I hopped out and ran off. When I returned I had only missed 200. That I could make up easily on my own. So, we swam on, and then some luck – Lynn and Libby both got out at about 9,000 meters to go to the bathroom. I got the 200 in so the three of us could finish together. Lora and Laura had continued through both unplanned breaks and finished a little ahead of us. And Tom and Jeremy got out about 7.5k I think. Soon we were finishing up – the last 2,500 felt almost easy, slow, but easy. And it went by very fast. We ended at about 7:15, and the kids were gathering for their regular winter break swim time. They let people take a couple of lanes to finish off, but we were done before they started. About 3.5 hours for 10,000 meters. We did a mix of stroke, pull buoy/paddles, fins, and fins and paddles (the last was the least used combination). One less bathroom break than last year, and no coming back to finish off the distance! Hooray. We (My lane mates for the day) headed off to Waffle House for a little post swim refueling, and then I headed off to work. At about 3:30 I could feel the fatigue in my arms, and some soreness. And I was sleepy. Luckily my manager told me to log off about 4:15 for the holiday as I was about to fall asleep anyway. Of course I couldn’t sleep so I read, and relaxed some. And went to bed early (9:30). I had a terrific NYE – just the hours were flip-flopped from the traditional celebration time. I know others who did this DID go out that night. Those I spoke to also napped at some point in the day. I was happy with my day. I had set some goals, worked for them, made wise choices, and swam strong. And today I went and swam. Only 45 minutes and I was done. My arms were sore, and not much “umph” but no pain like last year. I was fine, but when I saw the 9×100 set after 45 minutes of swimming I thought “I’m done today.” But I promised Maria I’d be back Monday. Of course! That extra swim per week really has helped. Now…if it only helps with my race times. You are a dynamo, yourself…. 10,000 meters…..pretty impressive. 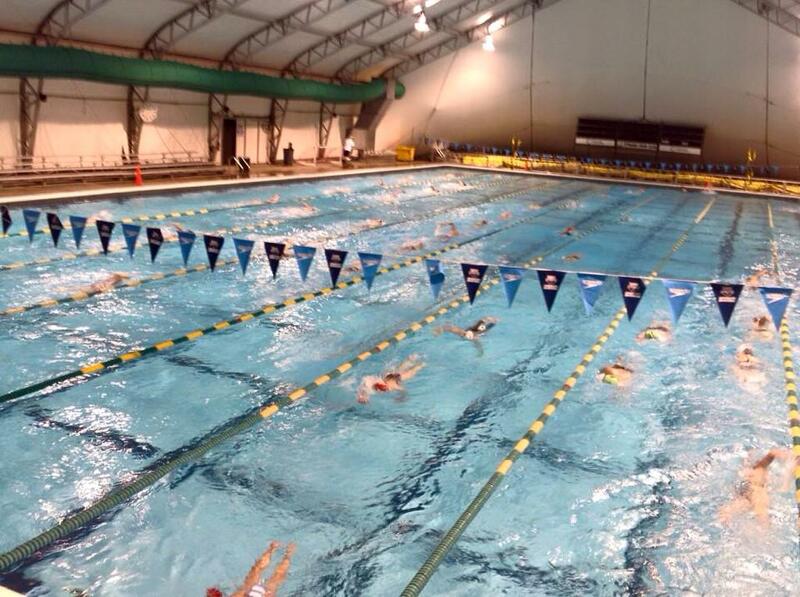 They have a group here in Arizona that does 100 X 100 every New Year…..I think I like your way better. Hope you are doing well. You continue to inspire even 3,000 miles away!